Cowboy Bebop poster print artwork design. Get this Cowboy Bebop GTA fanart as metal print, t-shirt and much more. Cowboy Bebop may have only run for 26 short episodes and a movie, but its influence and importance resonates to this day. A critical and commercial smash in both Japanese markets and around the world, Cowboy Bebop is a siren song for anime and adventure lovers of all stripes. With such a short existence, it’d be easy to assume you know everything there is to know about Cowboy Bebop. You’d be wrong. When we meet our heroes, they’re in the process of getting their lives in order after a period of chaos. In a stroke of fate, the universe made sure things started coming together for them exactly three years ago. 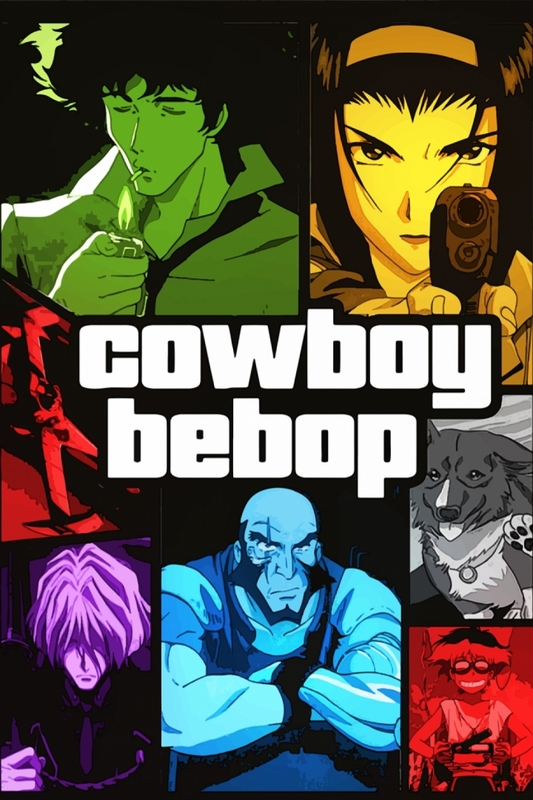 Jet and Spike started working together, Fae was taken out of cryofreeze, and Ed wandered away from the orphanage—and as a result, we have Cowboy Bebop.